Well, folks, that certainly did not last long. Two days ago, I wrote an article in relation to the ability of being able to download normally unsupported PSP and PS1 games indirectly onto PlayStation Vita's. This indirect download tactic involved users downloading games via a PS3 or from Sony's web-store directly and then starting downloads on a Vita by accessing their download histories. Hopefully all of you who were interested in obtaining these games acted quickly, because Sony is starting to remove this indirect downloading ability! When users first noticed this ability a few days ago, none were too sure if it was an intentional and unannounced move by Sony or some unintentional mistake. 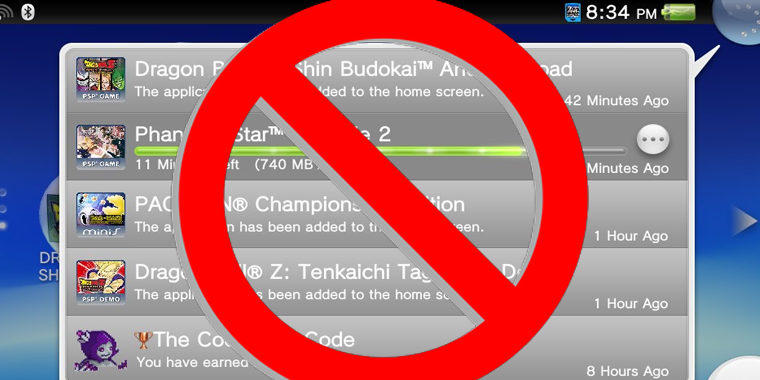 According to various Vita users, PSP and PS1 games that were made available just a couple of days ago are now retrogressing to their former "unsupported" state. Some users, including the writer of my first source, even uploaded some screenshots showing Sony's actions empirically. With the retrogression in mind, I'd say it is fair to say that the Vita retro game downloading was some sort of mistake made during maintenance. The good news is, the retrogression of games to "unsupported" evidently has not been happening for every Vita user. Perhaps Sony's actions will be coming in waves, so if you want to get some normally-unsupported games on your Vita, I advise you act quickly before it is too late! What many are confused about is why Sony would want to disable such an awesome feature. Perhaps there are some licensing issues of the games amongst publishers. Some propose that Sony stopped the downloading because the games technically were not supposed to be compatible in the first place and fear emulation issues. Going further, this downloading allowed users to access PSP demos and other content that, in the past, has been used for software exploits. So, some could say, Sony was acting simply out of prevention of having to deal with exploits. Whatever the reason, Sony has yet to make an official statement on the matter. Interestingly enough though, Shuhei Yoshida actually tweeted about his playing of the first Spyro game. In the tweet he mentions controls he assigned for the game and was seemingly enjoying himself. So, clearly, playing the classics on the Vita is something enjoyable. Perhaps by seeing people enjoying themselves in this manner, Sony will take the matter into consideration and one day enable such downloading for the Vita on purpose. If I hear any other updates on this matter, I will be sure to update this post. If anyone sees anything before I do, please feel free to let us all know and I will add it to this post while giving you credit.